Reece said that his form and wins had been seen as a breakthrough but he knew it was going to happen. Of his British Champs win and World Athletics races, "It was great being in front of a British crowd." Maya said, "Getting gold really gives me a boost as I enter the Senior Age Group. U23 is going to be tough but it's a real positive to see new athletes coming through." Alistair said the additional funding has given him a real boost and would be really helpful for the additional travel and accommodation costs living in Guernsey ensues." When Sydney Wooderson was alive it was very fair to say that he was the ‘Greatest living ‘Heathen’. When Sydney died at the end of 2006 that title quite rightfully passed to Alan Brent. Alan joined Blackheath Harriers on 4th March 1946 at the age of 27. He has died at age 98 after 71 years of extremely distinguished service to his Club and to Athletics. His wife, Brenda, had died at age 96 less than 4 months previously. Her support of Alan and her service to the Club had also been legendary. Alan joined as an Athlete shortly after the War so it is probably best to start by giving a brief summary of his career as a runner. He ran in the Blackheath team in 20 consecutive Southern Cross Country Championships and in 20 consecutive National Cross Country Championships (1946/7 to 1965/6, so 47 years of age on his last appearances). He was in the scoring 6 on 18 occasions in the National and 16 times in the Southern. Just 3 team medals though, bronze in the 1948 National (the race being won by Sydney Wooderson) and silver and bronze in the 1948 and 1950 Southerns. His best National saw him finish in 32nd place and he managed 15th in the Southern. His first Club win was in the 1946 ‘Closing 5’ where a far too generous allowance of 5 minutes was given to him. Newcomer having it over on the handicapper! It has ever been thus! He ran regularly for Kent in the Inter Counties and did very well on the Road in events like the News of the World London to Brighton which became the National 12 stage. He had been known to win Club events by 5 minutes and famously in the Club ‘B’ team with Braughton and Scotting “gleefully defeated” the ‘A’ team Club road specialists in the 1952 Mitcham 15. He later made his mark with other “geriatrics” in the Sunday Times Fun Runs. ‘Fun’ seeming a misnomer as the Club History records that these events were fiercely competitive. The Club History records that what was “more impressive than his consistent running was his continued industry for the Club”. He created “an impression of integrity, understanding and dedication not readily matched”. He was Club President in 1966/7 leading an administration including Tony Hayday, Geoff Last, Bob Taylor, Alan Ball, Brian Stone, Bob Richardson, Norman Page, Jim Day and Peter Baigent. Alan was for 5 years the Club’s Cross Country Captain. For 11 years he did penance for his win in the 1946 Closing 5 by being George Brooks’ Assistant Handicapper. He was President of the South of Thames Cross Country Association in 1966. 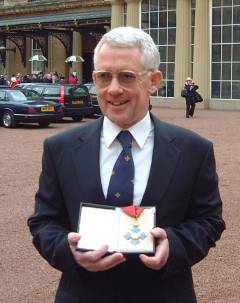 Also President of the Southern Counties Cross Country Association, Kent County Athletics in 1979, and the English Cross Country Union or ECCU (now ECCA) in 1989. He was presented with the Queens Jubilee Medal in 1977 and was recognized by Bromley Sports Council with an award in 1989 recognising his service to Sport in the Borough. 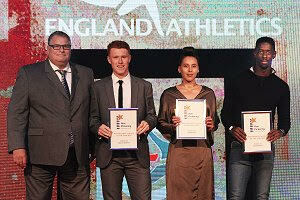 More recently he won a prestigious London Sports award for his outstanding contribution to Athletics over so many years. He reckoned he had been to 50 consecutive Nationals and it was ironic that the first two he missed were in 1994 and 1995 when the Club won the team title. He also missed seeing the under 17s win the team title in Havant in 1997. He attended every day of Athletics at the 1948 London Olympics and could point out on photos exactly where he and Brenda sat. He was asked once to point out Jack Braughton in the 1948 Olympic Men’s Athletics team photo. “Jack wasn’t in the photo”, he said, “he couldn’t get time off from work”. He served with Jack on the Board for Norman Park Track Management until they were both in their 90s and Alan was a regular at Club Track events where he took responsibility for all the field equipment. Meanwhile, wife Brenda worked in the Track café with Anne Cilia’s Mum, Vi Stenning, and Ken Johnson’s wife Hilary serving tea and wonderful cake baked by Brenda. You felt quite deprived if you found that they had sold out and you hadn’t had a piece. Club committee meetings with Alan in attendance were quite a lesson. He was never rattled and never lost his rag. His contributions were always measured, thoughtful and intelligent. A great man with great knowledge and great judgement. 20 or so years ago, Club Dinners were more frequent and he and Brenda sat with others of their age group. Brenda ran the raffles bringing her ‘old bag’ which was eventually replaced by a ‘new old bag’. At one of these dinners he was ambushed so we could properly celebrate his 80th birthday. Peter Lovell provided some fine artwork and Alan, giving an impromptu speech, gave younger members the benefit of his advice: “retire early and hammer the pension fund”! His 90th was a very special Club occasion with a full house greatly enjoying some fabulous tributes to a very special man. Brenda also made it upstairs for the first time in years. The ECCA President was there and Alan was showered with gifts and praise. Mike Peel took a brilliant photo of Alan and Brenda, printed it, framed it and presented it to them that very same evening. It was a proud possession in their home. As they both became housebound they were delighted to receive visits from Club members and these were always happy occasions. The owner of the garage around the corner from whom they bought all their cars visited one day bringing lots of photos. He had been one of Alan’s pupils and had been away on a School trip abroad with both Alan and Brenda. When Graham Botley made his farewell tour, one of his demands was to be taken to visit Alan and Brenda. Another very special and happy occasion. On one occasion Alan was asked whether he would be going to the Club photo shoot. He hadn’t realized it was taking place. Denis Lawrie and Steve Hollingdale did the honours so Alan featured in the 2012 Club photo. When he could no longer run, he swam. Often with PP Vic Beardon. Just a couple of days after his 80th, Alan celebrated by competing in the Maryon Wilson swimming race. The Blackheath Harriers Social Club was formed in 1973 and this was chaired by Brenda. Ladies competed in their table tennis team using the Blackheath Harriers name. With barn dances, raffles, jumble sales and tombolas the Social Club, including the likes of Maggie Haines, raised an awful lot of money that enabled much needed work to be done in the Clubhouse and at the Track. Brenda’s reward was being made an Honorary Life Member and later a Vice President. They both gave great encouragement to Youth and the Club History records that “many can testify to their encouragement of youth, not only officially or on coaching courses, but morally and always cheerfully”. He was a very special man, they were a very special couple. Not sure we will ever see the likes of them again. It is with much regret that I have to report that the very popular Hanna Cordell has passed away recently after battling illness, having given her life for and so much to the sport of athletics. Hanna was the club secretary for Blackheath & Bromley Harriers AC for many years and has also been a team manager for the many BBHAC track and field teams, a regular timekeeper and a track judge, and brought her strong organisational skills with her every time to the events she would attend. Prior to that Hanna had held a series of management positions with Bromley Ladies. With husband Dave to who she was married to for 49 years, Hanna met many new friends from the world of travelling officials who went on to become good friends from many different clubs. Hanna (nee Grundlehner) was born in Arbon in Switzerland in April 1946 and met Dave when she was a student staying in London with Dave’s parents, never returning home in the 1970s. Although not a serious athlete herself, Hanna did run events like the 7 Sisters, and 10km and half marathons, but her true love was officiating in the many capacities whether it be track and field, cross country or road events. Always up early on competition day, Hanna would accompany Dave to wherever they were going to be ready to pitch the club tent in a favourable location to provide much needed shelter and a base for the club athletes who would turn up later in the day. Living close to BBHAC in the Bromley, Kent, area for the past 20 years, Hanna leaves behind her husband Dave, two children Alice and Tom and two grandchildren Shannon and Joe. Hanna will be a tough act to follow as Club Secretary and also Trophy Secretary as the club has many trophies which have all been photographed and catalogued by Hanna. More importantly it is known that Hanna made tea in bed for Dave everyday of their married life, not sure what happens now ! Hanna never expected thanks or praise for her efforts and was always seen at the club events throughout the year, quietly going about her job. Hanna’s life was devoted to our much loved sport and is a great loss to her family, her friends, BBHAC and the sport of athletics. Our Serita Solomon is one of the athletes featured in SportsAid’s new film, called I Will Be Next. See http://youtu.be/VHlrkW8txZI to watch her in action. 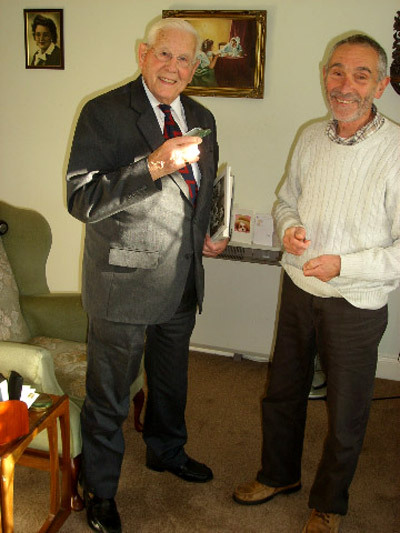 Above is a photograph showing presentation of 50 Year Award to 93 year old Fergus Ankorn, albeit seven years late! He also has a recent biography published, "Captivity, Slavery and Survival as a Far East PoW". £15.99 from www.pen-and-sword.co.uk I also presented him with the 2nd edition Club History and Sydney's "Forgotten Champion". As I write this on October the 18th, 2011, I realise that Blackheath & Bromley club runner, Scott Overall, who ran 2:10:55 for the marathon in Berlin, on the 25th of September this year, had run the fastest marathon time by any UK runner since John Brown did 2:9:31 in the London in 2005. Yet it was Overall"s first attempt at racing the distance. He ran 47:37 for 10 miles at the BUPA Great South Run on the 24th of October last year, which must say something about his distance running ability but his titles were- UK 5000 track Champion in 2009 and "Under 23" AAA"s Champion over that distance in 2005. I talked to Scott just before he took Blackheath & Bromley up from 56 to 25 on leg 2 in the National Six stage road relay at Sutton Park on the 15th of October.
" 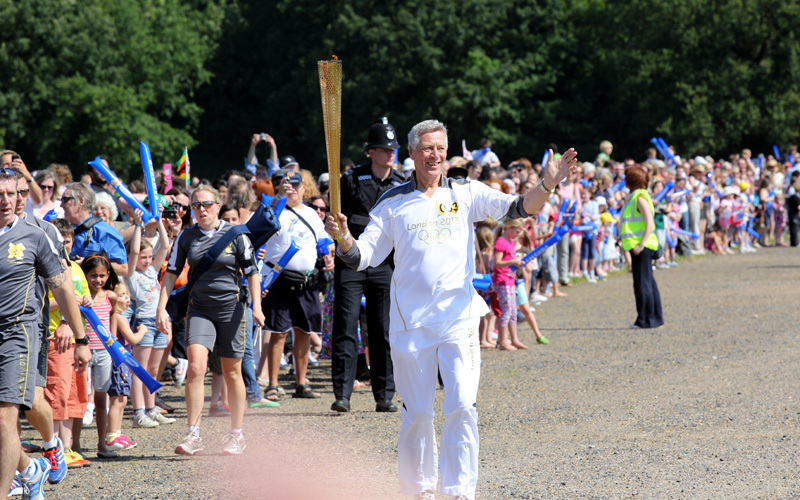 When I was about 14/15 at Orleans Park School in Richmond I did cross-country and joined an athletics club from there." "As a junior we used to go to the National junior road relays at Sutton Park, Birmingham. I ran for Hounslow at the time. We used to be quite successful at the road relays as juniors." "I was always about average. One of the top 10 to 15 fastest times of the day but we would be leading after two legs and Mo Farah handing over last." "We had good runners as Hounslow the Sam Haughian, Ben Whitby and Mike Simpson. Probably the best team in he country for a six stage. A lot of strong guys." " I think so. Half the battle was trying to get in the team." " I was quite successful as a junior" (Here are some 1500 times he was doing as an "Under 20" in BMC races at Watford-31/7/02-3:49.69; 14/8/72 -3:48:72; 28/8/02-3:49.04--Later on his PB was 3:41.90-2008 and 3:58.61 indoors for the mile in 2010 in the USA).
" I remained quite successful as a junior at Under 23 level as well. I went to the European Championships (6th in Under 23 Final or 5000, on 15th of April in Erfurt Germany, in a time of 14:17.6)." " I got a scholarship to America so I went out there to Butler University, Indianapolis, for three or four years." " I think going to America was what helped me massively." " I went out there in 2004. In the UK if you got under 14 minutes, that was seen as amazing but when I went to the USA there were guys over there at University under 14 minute all the time. Over there it is not seen as anything!" " It opened my eyes to what is good rather than what you thought was good. So much depth." "The competition is great. You can only be brought along." `" I was there 2004-07. I stayed out in the States another year with my coach ROBERT CHAPMAN and came back 2008/9." " I still go over for a couple of months at a time to Flagstaff, Arizona. For the last four years I have gone to Flagstaff and then come down and raced at Stanord and Mount Sac races then come over here." " Up to 4 or 5 weeks at altitude then come down and you can either race straight away, which we normally do at Mount SAC and then you have two weeks to Stanford." "Injuries have prevented me from running on the track for the last couple of years!" " At the same time out of something bad came something good on the road!" " At the beginning of this year I did not race very well at Stanfard and Mount Sac and then I did a half marathon a week later, because I knew there was a lot of prize money." " I was in shape but not running very well so, I did that and ran 63:21 not really training for the half marathon (Half marathon at Indianaplolis on 7th of May) and so that was when I decided to start looking towards doing a marathon because, I have always run quite well on the roads and stuff. BERLIN WAS MY FIRST ONE in 2:10:55." I thought he was good at cross-country and track as well but his reply did not indicate that, as far as he was concerned. "Cross-country is not that great but track is O.K but the road I seemed to like"
Now for Berlin and his good time:- " I felt quite comfortable the whole way really. The first half I felt fine, felt great. I was running with a French guy. We worked together to half way. He kind of dropped off at half way." "The last half of the race I was completely on my own. I seemed to cope O.K with that. Really the last 5k was probably the hardest. I was having to work quite hard for the last 5k to remain on pace." " Not really. Obviously having Mo. I have known him since I was 14 or 15 and seeing what he has achieved and that can only be an inspiration. I have known him since he was quite young so, to know he is World Champion is quite special really." Highlight of the Veterans Athletics Club Championships at Lee Valley, on 22 February 2009, was a new UK best in the over 75s shot putt. Gordon Hickey, who in his younger days was one of Britain’s top high jumpers, produced a throw of 9.89 to improve the previous record by 14 centimetres. Looking at the imposing bulk of British Record holder for the M70’s shot Gordon Hickey, it seems hard to believe that he was once the Southern Counties high jump champion, was coached by Sir Arthur Gold and trained with the Royal Ballet. The 70 year old, has been competing for Blackheath & Bromley Harriers AC for 49 years during which he has metamorphosed from one the country’s top high jumpers to head the age group rankings for the shot and throws pentathlon. Highlight of his career as a high jumper was winning the Southern title. “I must have jumped 6 foot 2 inches over 30 times but then towards the end of my career I cleared 6 foot 3 on a grass run up.” He does wonder what he would have jumped using a tartan runway. Specific event training for the high jump was not a year round cycle. “I did no jump training in the Winter. We’d just play football and then around March time started to think about Athletics”. Perhaps he would have gone higher had he trained specifically for the event but the other factor militating against his jumping was his job as a film and tape editor with ITN. Nightshifts every other weekend and travel could intrude. He recalls an assignment in Belfast in 1970 where the only thing that didn’t seem to get bombed was his hotel. One of his last high jump competitions saw him return to the straddle as just as the jumpers were about to start the event at Charlton Park a lorry pulled up and took the mat off to another higher League Division match at Sutcliffe Park. They were left to land in the sand, an opportunity turned down by some of the field but accepted by Hickey with some aplomb as he won the competition . He currently does a couple of training sessions a week but competes very regularly. He can still be seen in action in the Southern Men’s League either in Division One and Three often beating athletes who are 50 years younger. In the 2001 season he also competed in the British Athletics League Division One. The match at Eton saw the British Over 65’s Record holder going head to head with the USA’s Olympic Silver Medallist from Sydney 2000 Adam Nelson who was competing for Birchfield. Nelson won. “The only time I’ve been in a competition where someone has thrown over twice as far as me” commented Hickey who didn’t enjoy the experience. He is bluntly philosophical about his achievements. “ It’s not a case of how good you are it’s more a matter of whether you are still alive. You may be the most talented athlete in the world but it’s no good if you’re pushing up daisies” He added that the standard of sandwiches at funerals is improving. John Herring, who died on October 7 aged 68, enjoyed a long association with the London Marathon. The Marathon"s inaugural running in 1981 was so popular that the founder, Chris Brasher, and his team realised that they needed specialist help. Among those they approached was Herring, a former international athlete who had been assistant director of Crystal Palace Sports Centre since 1970. From 1982, Herring took responsibility for the start of the next 12 London Marathons, in which the number of runners has increased from 16,000 in 1981 to around 30,000 today. This was no easy task, since it involved co-ordinating, for both the men"s and the women"s event, separate starts for the "elite" runners, the celebrities, and the general mass of participants. From 1994 Herring acted as the Marathon"s course manager for three years, another demanding role which involved responsibility for the 26-mile course and the smooth running of the race on the day. From 1996 until this year, Herring acted as a consultant to the Marathon, with special responsibility for liaison with the police. John Herring was born on April 10 1935 at Lewisham, south London. After attending Colfes School at Lee Green, near Lewisham, he went on in 1953 to the London School of Economics. Two years into his Economics degree course he decided to leave, emerging an excellent athlete - he had been a runner since the age of 14 - and a proficient bridge player. National Service with the RAF allowed Herring plenty of time to pursue his athletics, and he then became a Customs and Excise officer based at Surrey Docks, remaining there until taking up his post at Crystal Palace, from which he retired in 1987. 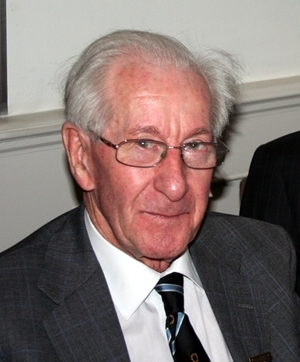 Herring was a lifelong member of Blackheath Harriers and enjoyed a successful track career, representing Britain over 5,000 metres in the 1964 Tokyo Olympics; he finished sixth in his heat. That year he was ranked fourth in the country behind Mike Wiggs, Fergus Murray and Bruce Tulloh. It was with typical wry humour that Herring noted, just months before his death, that this year"s winning time for the 5,000 metres at the AAA championships was more than five seconds slower than the time he set almost 40 years ago. Although forced to give up running at the age of 50 due to problems with his Achilles tendon, Herring continued to pursue a healthy lifestyle, swimming 1,000 metres every day. In the mid-1990s he moved from Beckenham to Sudbury, in Suffolk, where he indulged his passions for listening to modern jazz, good food (he was an excellent cook) and fine wines. In 1958 he married Shirley Dyer, who survives him with their twin son and daughter and a second daughter. Chris Brasher died of cancer on February 28th at the age of 74. Many column inches of newsprint over the past few days have been devoted to the achievements of his remarkable life and I need do no more than repeat the bare outlines here before moving on to Chris"s considerable contribution to Ranelagh Harriers. Born in British Guiana in 1928 and educated at Rugby and Cambridge, Chris discovered a love of the adventurous outdoors early in life and before the age of 22 had participated as a geologist on two expeditions to the Arctic. He was introduced to serious athletics at University and quickly made an impression, competing in the 1952 Helsinki Olympics before famously helping to pace Roger Bannister to the first four-minute mile in 1953. Not content with playing a bit part to greatness he resolved to dedicate himself to the 1956 Melbourne Olympics where he nevertheless lined up only as Britain"s third-choice steeplechaser. Against all expectations - except perhaps his own - he won the gold medal in a time, 8.41.2, that would still rank highly in the UK today. A successful career in journalism and broadcasting followed and he was twice voted British Sportswriter of the Year. But he always continued to pursue his own sporting passions which from the early 1960s had included orienteering. A business based on selling orienteering gear from the boots of cars preceded the opening of the first Sweat Shop in Teddington which in turn led to the highly lucrative sports shoe distribution company Fleetfoot. Living in River Lane literally just around the corner from our clubhouse, Chris became a Ranelagh Harrier in the mid-1960s. In July 1965 he organised in Richmond Park the first orienteering event ever to be held in the south of England, won by track international Tim Johnston with Ranelagh"s Jeff Bull and Rex Lofts 2nd and 3rd. Afterwards over a beer in the Dysart the Southern Navigators club and the Southern Orienteering Association were formed and one year later Chris became chairman of the British Orienteering Federation. Chris was an enthusiastic member of the Ranelagh team that set a new record of 33.41.15 for the Pennine Way relay in 1971, an account of which he later presented to a wider audience in an article in "The Observer". Another article two years later centred on the South Downs Way where several teams from Ranelagh and other clubs ran the route as a relay using rules devised by Chris. It was fitting that Chris"s own team of himself and the two Ians, Milne and Macintosh, should set the day"s fastest time of 8.04.43. Just a few weeks later Ranelagh set another footpath record on Offa"s Dyke and again Chris was involved, taking amongst other sections the final stage into Prestatyn where he insisted on running all the way down the beach and into the sea. In our centenary year of 1981 we were back in the Pennines and although over three hours faster than ten years earlier we fell just 48 minutes short of the new record. Chris was in the team of course and in 1987 at the age of 58 was one of the prime movers and organisers of our final (to date) effort when severe weather unfortunately caused us to abandon the attempt on grounds of safety. He took part in the more traditional events too and won three club handicaps: the Clutton Cup in 1970, the Baker a year later and the Page Cup in 1975. In 1979 he and his erstwhile Olympic steeplechase colleague John Disley missed the start of the Southern Veterans Over 50 championship at Milford by a reported two minutes yet still ran through the field to finish 11th and 22nd and together with Ray Dare 27th they won bronze medals. Timekeeping was better in the National event at Parliament Hill two weeks later where the same trio finished 4th, 17th and 44th and the team 2nd. It was later that same year, with ten other Ranelagh Harriers on the Sweat Shop tour to the New York Marathon, that Chris was inspired to wonder whether London could organise a similar event. "We have the course, a magnificent course, but do we have the heart and hospitality to welcome the world? ", he wrote. Only a man of Chris"s vision and determination could have brought the dream to fruition a mere 18 months later. Many Ranelagh Harriers helped in small ways in that first event, from recceing the route to behind the scenes paperwork to manning the registration desks, and many continued to volunteer for years to come; others took full-time jobs with the Marathon organisation. The first race also featured another series of "Observer" articles, pitting the John Hanscomb long steady training regime against the Brasher "fartlek" mixture of speedwork and distance. I don"t know how the respective camps" guinea pigs fared but John won their personal battle in the race, 2.54.29 to 2.56.56. Chris served on the club committee for many years and often represented the club at meetings of the sport"s governing bodies. He also provided valuable assistance in our various struggles to improve and rebuild our clubhouse. In later years he developed an interest in horse racing and became an enthusiastic owner. In pursuit of these interests he moved out to Berkshire but retained an active interest in both Ranelagh and Thames Hare and Hounds of whom he had also become a member. Chris Brasher was an extensively generous man. Within Ranelagh there were the many rounds bought at the bar, wine for our suppers with Thames and two trophies, the Brasher Cup under 15 boys championship and the Brasher Bowl women"s marathon championship. But much more importantly he devoted large sums of money to conservation projects to protect some of the wilder and most beautiful parts of our country, via foundations such as the John Muir Trust and the Chris Brasher Trust. The latter receives 40% of the profits from the Brasher Boot Company, another of Chris"s businesses, which he founded in 1983 with the aim of developing a walking boot with the comfort of a running shoe. He also supported many young athletes via the Ron Pickering Foundation. 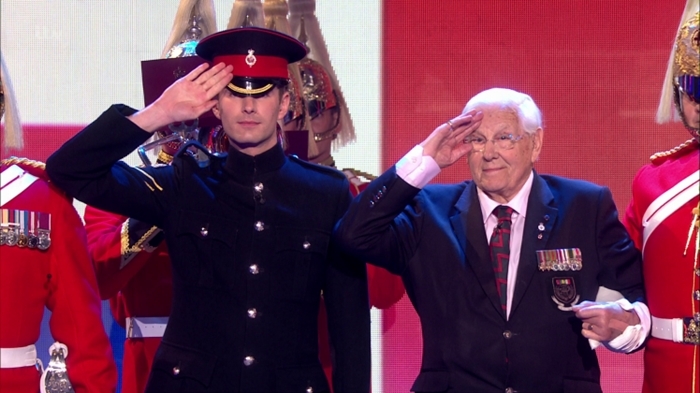 But perhaps his greatest legacy will be the London Marathon itself which has raised and will continue to raise millions of pounds for charity while providing thousands of ordinary men and women with the opportunity to meet a challenge most of them would never have dreamed of attempting. As Hugh McIlvanney wrote in this week"s "Sunday Times": "I"m glad Chris Brasher was part of my life. An entire nation has cause to say the same". Chris was appointed CBE in 1996 and is survived by his wife Shirley, daughters Kate and Amanda and son Hugh, himself a steeplechaser and a Ranelagh Harrier for some years. We offer them our sincere condolences. In writing the above I have deliberately kept to the facts and figures and avoided repeating any of the many Brasher stories and anecdotes that come to mind, for it occurs to me that many of us in Ranelagh have such stories to tell. Please send in anything (printable!) that you"d like to pass on and I"ll compile them into a Brasher miscellany. Three of the Clubs athletes have received grants at the London Borough Of Bromley Excellence Awards 2002 which were held at the Pavilion Leisure Centre. 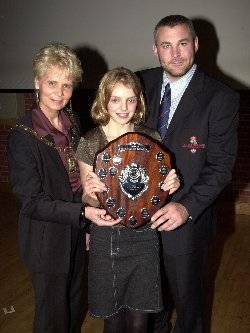 The 2002 winner of the prestigious "Sports Scholarship Award" was Rebecca Taylor. At 13 years old she is a valued athlete at Blackheath Harriers, Bromley - where this season she has set 3 new club records. Her 800m record is the fastest in the UK this year and her 1000m record is 4th in the United Kingdom all time rankings. She retained her County Under 13 titles at both cross-country and 800 metres and added to these with victory in the London Mini Marathon. That our Club holds copies of ALL past issues of the Gazette, the Courier and also Athletic Weekly as well as other Athletic items. If you would like to do research or want more information please contact the Archivist, outlining your requirements. This link gives you details of Supplements, Newsheets and Couriers.